Phloby Vs. C. Goff III - "Book Of All Things"
Gosh, it sure is fun keeping track of these hometaper folks. They're always collaborating with different people and you can usually expect that the next recording you get from them will sound absolutely nothing like the previous one. Charles Goff III first came to my attention with his Magic Potty Babies band (which made my best of 2001 list) and then on a collaboration with Hal McGee. Book Of All Things is a collaboration with a gentleman named Phloby who I've not heard of previously and consists of a crazed, chaotic and good fun parade of sample manipulations. The CD liner notes explain that the duo employed four turntables and a sampling/looping CD player to work with their source materials. They call it Plunderphonics - the manipulation and reconstruction of multiple media sources. Imagine the mad studio craftsmanship of Vas Deferens organization but with the focus on sounds and samples rather than music and you'll get something like Book Of All Things. Half the fun is catching what's recognizable and the rest is just diggin the way these guys paste it all together into one big zany stew. The whole things moves non-stop from start to finish and so will my description. Lessee... mished, mashed, blended, cut, pasted, and buried together we've got (what sounds like) strange pulsating electronics and collage bits of rock combined with science documentary chat, commercials, old television variety shows, Mr Rogers, John "Dr Dirty" Valby, a widely used LSD scare film bit, a repeating loop of what sounds like a sample of Fred Frith's guitar against dance percussion and instructional speech tapes, jazz bits alongside Harry Nilsson's "Me And My Arrow", salsa music combined with wild studio cutups, and loads of other freaky samples. I wonder if these guys scanned the AM Radio dial for hours looking for weird programs to tape, or got their hands on old television shows? In any event, this is a fun listen though for full enjoyment you'll probably want to approach it like you would The Residents Third Reich ‘n Roll or something like that. And it all seems to flow nicely from beginning to end. Well... as far as chaos and pandemonium can be considered flowing that is. Sounds sculpture fans take note. 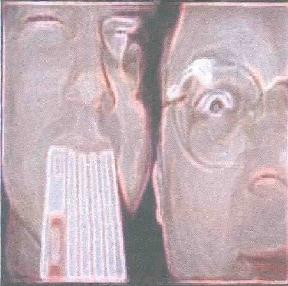 For more information you can visit the Taped Rug Records web site at: http://www.geocities.com/padukem. Contact via snail mail c/o Taped Rug Records; PO Box 146; Lawrence, KS 66044.